DULUTH, Ga. --(BUSINESS WIRE)--Jan. 17, 2019-- AGCO (NYSE: AGCO ), a global leader in manufacturing and the distribution of agricultural equipment and solutions, today hosted its annual AGCO Berlin Summit. The international industry event aims to bring together decision-makers in politics, economy and society to share their experiences and discuss the future of the agricultural industry. Today's ‘Feeding the World - The Future for Protein' summit was focused on aspects of animal welfare in the context of modern agriculture, including the need for sustainable protein production to meet an increasing demand for protein-rich foods. The AGCO Berlin Summit is a joint initiative of AGCO and the new AGCO Agriculture Foundation . The AGCO Agriculture Foundation develops charitable initiatives to enhance global food security, sustainable agricultural development and positive economic impacts, particularly in developing countries. As in previous years, AGCO Finance and AGCO Fuse Technologies are sponsors of the 2019 AGCO Berlin Summit. "Whilst discussing protein production, a special emphasis should be placed on the future of the animal welfare. Meat and poultry producers, especially in emerging markets with a growing middle class, are in need of comprehensive solutions to improve agricultural supply chains," commented Martin Richenhagen, AGCO Chairman, President and CEO. "Today, we have brought together industry specialists, politicians, scientists and animal welfare experts to discuss a number of pressing matters, including challenges to feed a rapidly growing world population, as well as solutions that not only boost overall performance and productivity of farms, but also offer innovative and sustainable ways to improve animal handling and the fair treatment of animals in our agricultural supply chains." "By 2050, our population will grow to 10 billion people. This means that we must increase agricultural production by at least 70 percent over the next three decades," warns Rob Smith, AGCO Senior Vice President and General Manager, Europe & Middle East . "At the same time, the importance of quality and animal welfare standards is increasing. To meet these challenges and secure global food supplies, we have to develop and introduce new innovative technologies to the food industry." 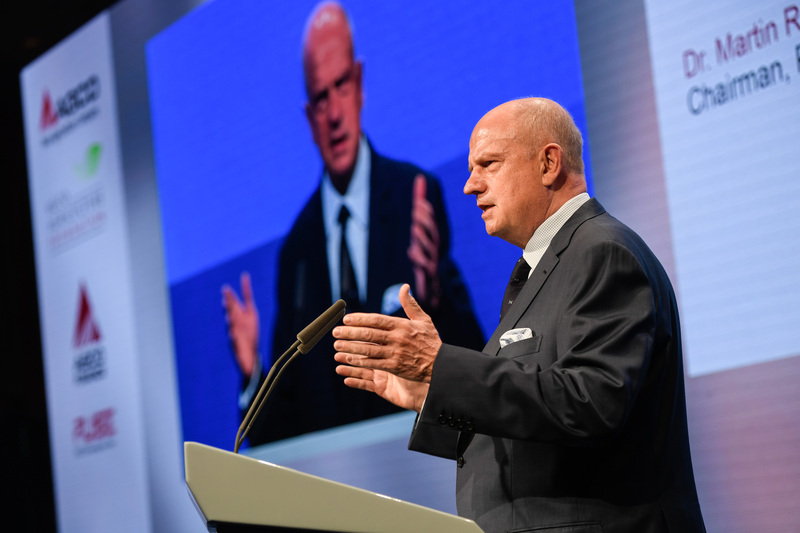 " AGCO invests extensively in the optimization of agricultural process chains and we welcome cross-industry exchanges," added Martin Richenhagen. "We are pleased to see the support from today's speakers and participants from all over the world for our strategy aimed at developing sustainable and innovative solutions for people and animals." AGCO (NYSE: AGCO ) is a global leader in the design, manufacture and distribution of agricultural solutions and supports more productive farming through its full line of equipment and related services. AGCO products are sold through five core brands, Challenger®, Fendt®, GSI®, Massey Ferguson® and Valtra®, supported by Fuse® precision technologies and farm optimization services. Founded in 1990, AGCO is headquartered in Duluth, GA , USA. In 2017, AGCO had net sales of approximately $8.3 billion . For more information, visit http://www.AGCOcorp.com. For company news, information and events, please follow us on Twitter: @AGCOCorp. For financial news on Twitter, please follow the hashtag #AGCOIR.